I am not one who had any disagreement with the new, almost-"DC You" iteration of Lobo. Every generation defines their own characters, and further the "fraggin'" Lobo of the 1990s was a far cry from Lobo's earliest appearances as is (heck, my favorite is still Slobo). I'm more than ready to give the "gentleman Lobo" (still a Czarnian, still a bounty hunter) a try. But a lot of these sub-"DC You" launches (not the actual "DC You" launches, but the ones that immediately predated them, like Deathstroke, Teen Titans, and New Suicide Squad) haven't quite landed for me, and that includes Cullen Bunn's Lobo Vol. 1: Targets. The best thing about Bunn's Lobo is the new Lobo himself, who brings the mayhem and is enough like his former self to please, especially in relation to other familiar characters, but without the parodic elements of the older version. Further I don't mind a bit of angst in my characters and I found very compelling the flashbacks that show what brought Lobo to this point. 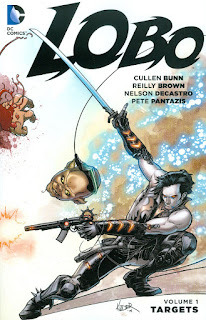 But Bunn tells a long, action-focused story, that for what actually happens could have been much shorter, and populates it with forgettable characters that don't add to the Lobo mythos. I was bored, frankly, and that's hardly what you want from a Lobo story. Targets opens with Lobo taking a contract to kill seven other bounty hunters before they themselves eliminate a target; when that target turns out to be the whole of planet Earth, Lobo becomes Earth's de facto protector, at least until his contract is up. That's markedly clever on Bunn's part, both as a device to bring Lobo planetside (into more familiar territory than the larger cosmos) and also as a way to tell a story with an anti-hero as title character and main protagonist. Unfortunately Bunn doesn't explore the implications of this as fully as I'd have liked, and it seems Lobo is leaving Earth behind by the end of this volume. The book's best chapter is the fourth, where the momentarily-Earth-friendly Lobo teams up with Superman. The two annoy one another just the same as they always did, allowing us to see glimmers of the old Lobo in the new. As well, in their truce and then when they finally fight, the reader learns the nuances of the new Lobo's code of honor, against the familiar backdrop of Superman and Metropolis. The team-up feels relevant, like something that adds to the new Lobo's story. Unfortunately, that's not something that can be said for much of the rest of the book. Consider for instance the third chapter, which apart from a flashback is entirely devoted to Lobo's battle with a matter-shifting bounty hunter. Aside from crossing another opponent off Lobo's list, there's nothing important about the pages-long fight sequence; that specific character is never mentioned again, nor does Lobo learn anything about himself or his circumstances from the fight. The issue could have easily involved some other bad guy or taken place against some other setting, or have been elided entirely between the issue before and the next. And the problem is any number of pages are like this, as when the characters simply fight and banter without any relevance to the plot. As well, what supporting cast Bunn gives Lobo consist of three human bounty hunters with too-ornate 1990s-esque costumes and names like "Rave" and "Luna," the latter in spandex and a cowboy hat. (Artist Reilly Brown pens most of the book's layouts, though not necessarily drawing the pages themselves; even so, most of the book's art reminds me of the bubbly work of Paul Pelletier, which itself reinforces the 1990s vibe.) The trio is nonplussed by Lobo being an alien killer, Bunn gives the audience no backstory by which to care about these characters, and they're generally undistinguished in the fight. When another assassin murders Rave and Luna toward the end of the book, it's more a relief that they won't still be around than anything perhaps supposed to be moving. Their third partner is Emily, inexplicably a fourteen-year-old hacker tagging along with the bounty hunters, but Bunn altogether misses the potential for comedy in Lobo teamed with a teenager. That Emily leaves in the end is equally a relief, but if Bunn brings her back, I hope she's used better. Amidst all of this are the assassin-known-as-Lobo's flashbacks to the fall of Czarnia, when he was the emperor's bodyguard, in love with the emperor's daughter, and had to kill both during a zombie-type plague. The lead-up to the disaster is actually suspenseful and moving, the site of the book's true emotion, and Bunn hints at some interesting mysticism regarding Czarnian blood rituals and the legend of the Lobo, a ceremonial title. The sub-plot here, essentially, is spot-on; it just needed a better main plot to go with it. Though, while I'm not one who needs all the answers right away, the audience might have benefited to know enough about "the Lobo" to at least understand why he was fighting his "bastich" self in the beginning (and/or how there can be two Lobos when all the Czarnians are supposed to be dead. Or was that a flash-forward sequence?). Equally I'm curious to know about the myth of the Lobo and the Xrexian Pariah, but this might have felt more natural in the story if Bunn had approached it before Lobo actually encountered the last Xrexian. My feeling is that, when presenting a relatively-new character, a DC series needs a story relevant to the character that helps explain the character to the audience, and enough familiar DC Universe touchstones to carry the series until it gets on its feet. I'm thinking about Judd Winick's first Batwing volume, for instance, a great book that had both of these elements. Lobo Vol. 1: Targets had precious little of the second in Superman's one-issue appearance, and even less of the first, with a story that could as soon have starred Deathstroke as Lobo. From what little I know, I think Cullen Bunn brings in Sinestro in the next storyline, and that's what I want to see, Lobo interacting with the DCU in a way that has an effect on something. If it's more, simply, of Lobo fighting a random alien, I'm afraid this isn't for me. Get the Collected Editions scoop before anyone else -- on Facebook! The best way you can support Collected Editions is by sharing it with others! Subscribe to the Collected Editions RSS Feed or recommend this post to your friends! · Animal Man Vol. 5: Evolve or Die! · Batgirl and the Birds of Prey Vol. 1: Who is Oracle? · Batman Vol. 6: Bride or Burglar? · Ravagers Vol. 1: The Kids from N.O.W.H.E.R.E. · Supergirl: Who is Superwoman? · Superman Vol. 1: What Price Tomorrow? · Superwoman Vol. 1: Who Killed Superwoman? · Wonder Woman: Who is Wonder Woman? · Zombo: Can I Eat You Please? Scan this barcode with your phone or mobile device to take this post with you wherever you go. Interested in advertising on Collected Editions, want to sponsor a pitch for your graphic novel, like to contribute a review, or just want to chat about trade paperbacks? Send an email to collectededitions at yahoo d-o-t com.